I also feel the need to do something a little more the chopping it up and eating it raw. So I make a little fancy. pretty, almond crunchy mustard type thing because that's what I was feeling and I figure the mr would like it too. Note that I ended up using half a green and half the purple because color is nice and also I ended up eating the other half of the purple before I could share it. But I caught myself before eating it all to may face and was proud of myself for thinking of others. The stuff. 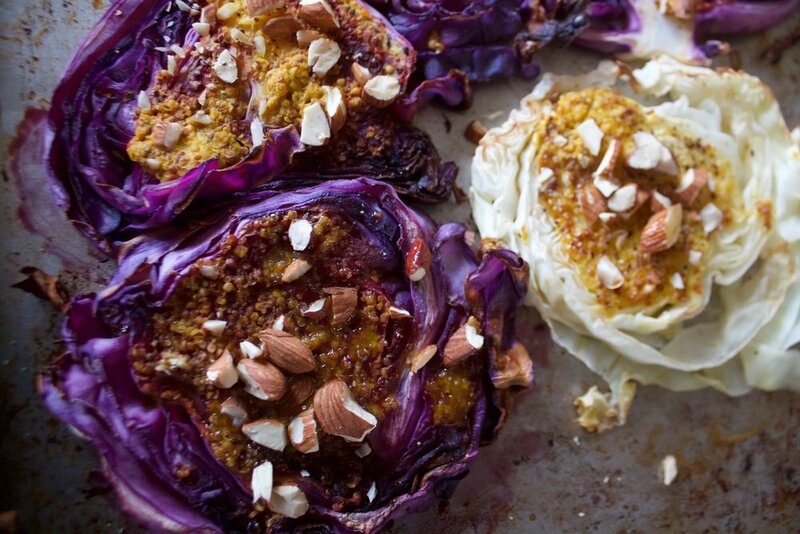 Cabbage, red or green or a bit of both, stone ground mustard, maple syrup, almonds and pepper. Easy peasy. Cut the cabbages about an 3/4 inch thick and lay them on a baking sheet. Pop it into the oven once it's preheated. While thats going on, mix some maple with the mustard and chop up the almonds. Just look how pretty it is. Serves from a baking sheet but would look so lovely on a nice plater, you know, if you want to be extra classy. This cabbage situation is all of it. Have a great weekend and hope the Thanksgiving planning goes smoothly. Slice cabbage into thick slabs about 3/4 inch thick. Try to get them roughly the same thickness so they roast evenly. Lay the cabbage on a baking sheet, not overlapping, and stick into the oven once it's preheated. Bake for 25 minutes or until the bottoms of the cabbage are crispy. 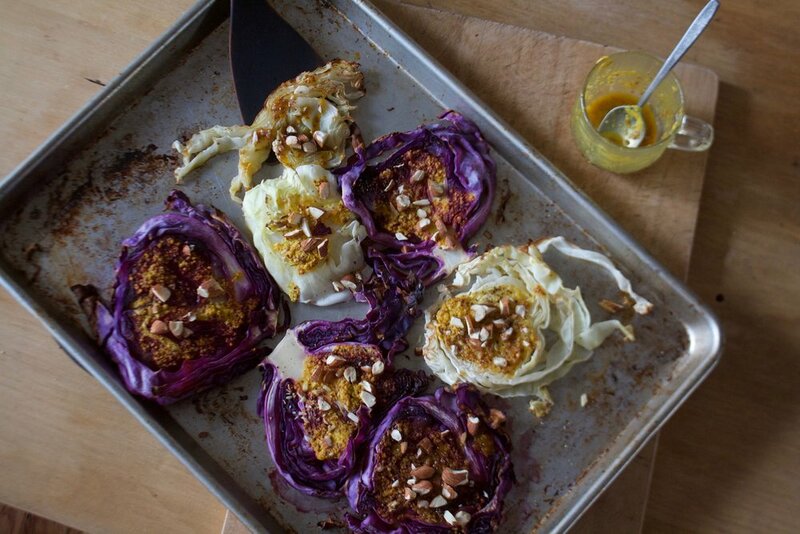 While cabbage is roasting, mix mustard and maple together and roughly chop the almonds. After the 25 minutes, grab the cabbage from the oven and flip each piece. Cover the tops with the maple mustard and sprinkle on chopped almonds. Place back into the oven for another 10-15 minutes and roast until the cabbage is as crispy as you like it. Remove from oven, sprinkle with good pepper, and serve. Extra maple muastd is welcomed to some. Any left over (but there won't be any) is great eaten cold before bed or tossed onto a salad for lunch the next day.